Caleb (Gleeson) is a computer coder who works for a large corporation owned by Nathan (Isaac). He wins a company raffle that involves spending a week at Nathan’s home, which is located in the midst of a vast countryside estate. On arrival he is given a key pass by an automated door system, and finds Nathan inside working out. Nathan soon reveals that he has been working on an experiment and that Caleb is there to conduct the Turing test on a robot with artificial intelligence called Ava (Vikander). Caleb’s job is to determine whether or not Ava could pass for human. That night Caleb discovers that the TV in his room is actually a monitor that allows him to view Ava in her room. There is a power failure and Caleb is unable, temporarily, to leave his room; when he does he finds Nathan has been drinking and not in the best frame of mind. The next morning, Caleb is awakened by a Japanese girl called Kyoko (Mizuno); she doesn’t speak English, a benefit for Nathan as he can speak freely about his work. Caleb spends time with Ava and as they begin to get to know each other it becomes clear she is flirting with him. During another power failure Ava warns Caleb not to trust Nathan, and that he has been lying to him. As Ava begins to make herself more attractive to Caleb, he begins to wonder if Nathan has made this part of her programming all along. Nathan lets Caleb see his laboratory, where he made Ava and mapped out her brain function. He insists Ava’s responses must be genuine, and reminds Caleb that if they are then the results of the Turing test must be positive. Later, Nathan gets completely drunk and when Caleb takes him to his room, he spies some cupboards and what looks like an “observation” room. When Caleb asks what will happen if Ava fails the test, Nathan is blunt: she will be updated and her memory will be erased. Caleb is upset by this prospect, and when Nathan gets drunk a second time, Caleb uses Nathan’s key pass to enter the observation room. There he sees footage that shows Nathan has been building robots like Ava for some time. He also looks in the cupboards and finds the discarded robots hanging up like old suits. When Caleb has his next meeting with Ava he tells her he has a plan for both of them to escape, and asks for her help. She agrees, and the next night they put the plan into operation. Working from an original script, writer/director Garland has fashioned an intriguing sci-fi thriller that asks the question, can an artificial being truly possess human qualities, particularly real emotions. 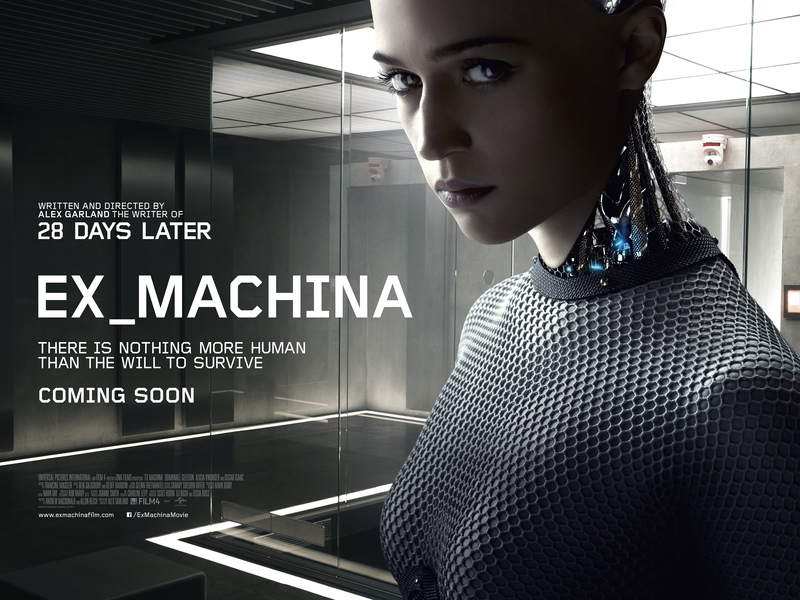 In asking that question, Ex Machina quickly becomes a guessing game for the audience, or as an old advert used to put it: is it live or is it Memorex? The answer, despite some wrong-footing and a few twists and turns in the narrative, is no, but with a caveat: there’s no answer to the further question of how Ava comes to fake the emotions she does display. It’s unfortunate for what is otherwise a skilfully constructed and intelligent science fiction drama that when we first meet Ava she’s as self-assured and poised as she is at the movie’s end. This leaves the audience feeling that she’s been playing Caleb all along, and that the whole notion of the Turing test is irrelevant; if Nathan is as brilliant as he seems to be, he’d know already how far her development has taken her. And why go to the trouble of getting Caleb to visit him (the raffle is rigged) when it’s also clear that as clinical trials go, the parameters are so loose? In the end it boils down to who is the most manipulative – Nathan or Ava. This conundrum aside, Garland shows a keen appreciation for his subject matter, creating a robot concept in Ava that makes physical as well as an aesthetic sense, and which allows the viewer to be reminded that she is, ultimately, a construct, not real and not able to function in the same way as humans, and even if latex skin is applied where and when necessary. This keeps the audience at a distance from her, while making Caleb all the more curious about the possibilities should she pass the Turing test. It’s a neat balancing act, and one that Garland keeps up throughout, even if he’s forced by his own script to step down from it by the expected denouement. The look and feel of the movie is very Seventies, the austere, below level laboratory complex a maze of plain walls and functional furniture. Only Nathan’s own personal living quarters look and feel like part of the “real” world. In the end, the coldness of the laboratory area reflects Ava’s personality, and at the same time acts as a catalyst for her and Caleb’s escape – in such drab surroundings and being so confined, is it any wonder she wants to leave? The motivations of all three main characters remain constant throughout, with Caleb’s naive, white knight demeanour expertly exploited by both Ava and Nathan, while creator and created share an antipathy toward each other that borders on hatred (on Ava’s part) and disdain (on Nathan’s part). All three actors give excellent performances, with Vikander warranting particular merit for the fine line she treads as Ava, making her both remote and alluring at the same time. Gleeson handles a role that could have been completely vanilla in comparison, but his pale features generate a mass of conflicting feelings and thoughts throughout. Isaac is the blunt force object of the trio, his stocky, powerful frame proving as muscular as his mind. As with Ava it’s a shame that Nathan operates at the same level for the duration of the movie, but it’s a compelling performance nevertheless. Garland proves to be a confident, accomplished director, gauging the performances with aplomb, and staging each scene with an economy of style and movement that greatly enhances the somewhat stoic pace and increasing tension. He’s aided greatly by cinematographer Rob Hardy and production designer Mark Digby, creating a futuristic environment for the science fiction aspects along side the wider marvels of the outside world Ava is so keen to see. There is the occasional narrative stumble – at one point, Caleb becomes convinced he’s like Ava and takes a slightly extreme approach to finding out one way or the other; Ava’s need to recharge her batteries would seem to preclude a proper escape – but on the whole, the script avoids the usual pitfalls such material engenders and has enough sense not to push things too far in terms of what Ava can do. That she is recognisably human by the movie’s end (at least to look at) is the movie’s ultimate triumph, reminding us that how we look on the outside is not as important as how we feel on the inside. 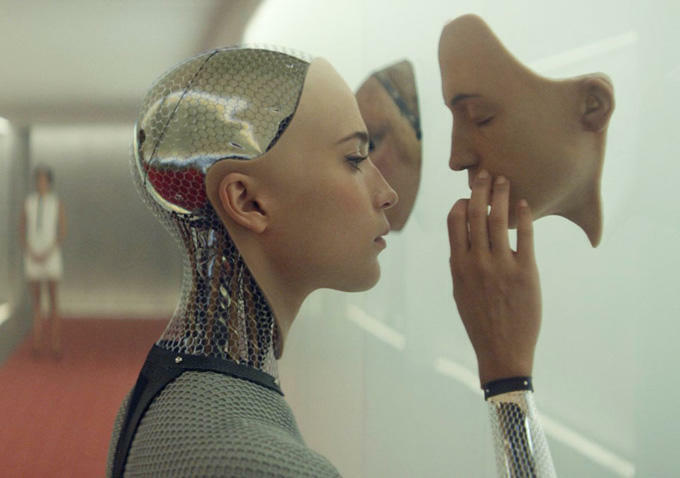 Rating: 8/10 – a sci-fi drama fused with metaphysical elements, Ex Machina is the first time in ages where science fiction themes have been treated with respect and intelligence; still, it’s not for everyone due to its pace and lack of perceived action, but on an emotional level it’s definitely punching above its weight.